As dietitians, we strive to offer nutrition interventions that will help our clients manage chronic medical conditions and maximize their health and well-being. Our rapidly evolving knowledge of nutrition science has allowed us to meet these goals in ways that were impossible even a few years ago. One of the most significant additions to the dietitian’s arsenal of therapeutic tools has been the emergence of medical foods, nutritional products developed specifically for the dietary management of disease. • Medical foods aren’t regular foods. They’re orally administered dietary products formulated for the management of diseases for which specific nutritional requirements have been established. • Medical foods aren’t drugs or dietary supplements and are monitored separately by the FDA. • All efficacy claims for medical foods must be based on recognized scientific principles and sound laboratory and clinical data. • Medical foods must be comprised of components designated as Generally Regarded as Safe. • Ingredients in medical foods must be listed on the product label in descending order of content. • Medical foods may be used only under medical supervision. This continuing education activity will provide an overview of medical foods and how they’re used in the management of disease, explain the nutrition professional’s role in using these products, and offer strategies on how to begin incorporating them in practice. Medical foods were classified and managed as drugs until passage of the Orphan Drug Act of 1983, which defined them as specially formulated mixtures of nutrients and phytochemicals to be used under physician supervision. Medical foods, per Bennett, often are developed and brought to market by pharmaceutical companies, but they don’t need to be approved or registered by the FDA. Although medical foods are used only under medical supervision, patients don’t need a prescription to obtain them. 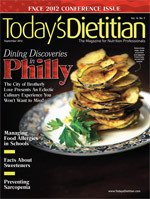 Many healthcare practitioners including dietitians currently use them in their practices under a physician’s direction. It’s important to note that medical foods can’t prevent or cure illness; they’re meant only to manage the course of a disease, according to Bennett. Medical foods often are confused with dietary supplements and nutraceuticals. Each is very different and serves different purposes. Dietary supplements are intended to enhance wellness among healthy adults and consist of vitamins, minerals, and/or herbs and botanicals. Nutraceuticals are nutrients, foods, or parts of foods that provide health benefits and combat disease. Like dietary supplements and nutraceuticals, medical foods are composed of combinations of vitamins, minerals, and botanicals, but they’re formulated specifically to manage nutritional deficiencies that affect disease progression. While many nutrients contained in medical foods are also commonly taken as supplements, medical foods contain specific formulations designed to improve risk factors associated with disease. Since the introduction of Lofenalac, the use of medical foods has grown steadily to include various products for the treatment of illnesses and disorders that have a nutritional association. These include chronic conditions such as diabetes, cardiovascular disease, and osteoporosis; inborn errors of metabolism; mitochondrial disease; wound healing; pain management; gastrointestinal disorders; and neurological and psychological disorders such as Alzheimer’s disease and depression. Medical foods are created for both pediatric and adult use and are available in a variety of forms, including powders, liquids, capsules, tablets, and bars. They may be specialized blends of macronutrients, vitamins, minerals, phytochemicals, and botanicals or preparations composed of a single nutrient. Moreover, today’s medical foods are much more palatable than the metabolic formulas of the past. Following is a brief overview of some of the diseases and conditions for which medical foods are used and their clinical efficacy. Medical foods used for managing metabolic syndrome, type 2 diabetes, and cardiovascular disease are designed to improve lipid profiles and blood sugar levels, combat insulin resistance, and support favorable changes in body composition (ie, increased lean body mass). These products generally have a low glycemic index and often contain folic acid, vitamin B6, and soy fiber, nutrients that help normalize serum homocysteine levels, a known risk factor for cardiovascular disease. In addition to these nutrients, medical foods promoting cardiometabolic health may contain formulated blends of plant sterols, dietary fiber, herbal extracts, and soy protein. They also may consist of single nutrients, such as folic acid or chromium, known to be effective in improving cardiovascular risk factors. Emerging studies are providing evidence that the components of these medical foods are effective in managing the symptoms of gastrointestinal disorders.27-29 In addition, clinical trials are under way to evaluate the effectiveness of these products in easing the symptoms of ulcerative colitis and Crohn’s disease. Medical foods have been developed to treat various neurological and psychological disorders, including Alzheimer’s disease and depression. The use of medical foods was once the sole territory of physicians, but RDs working in various clinical settings are now overseeing and promoting them. Sarah Morgan, MD, MS, RD, FAND, FACP, CCD, a professor of medicine at the University of Alabama, has a unique perspective on medical foods. A physician and an RD as well as a pioneer in the use of medical foods, Morgan directs the university’s Osteoporosis Prevention and Treatment Clinic, where she authorizes and monitors the medical foods patients use. Morgan, Cunningham, Huntington, and Dean agree that educating both patients and medical staff is essential to effectively using medical foods. Although they all have support staff to assist with patient instruction, each provides one-on-one teaching to their clients. • Learn about the medical foods that can help your patients. Areas to focus on are protocols for use, benefits, contraindications, and potential drug and nutrient interactions. • Get a copy of your state’s insurance medical food reimbursement policy and become familiar with the regulations and available resources. • Visit the websites of medical food manufacturers. These sites often provide useful information about reimbursement for their products. • Follow clinical trials evaluating the effectiveness of medical foods. Information about federally and privately funded clinical trials can be found at http://clinicaltrials.gov. • Network with other RDs who use medical foods. Groups such as the GMDI (www.gmdi.org) and the NORD (www.rarediseases.org) provide opportunities to share knowledge and information about medical foods. • Increase awareness of the benefits of medical foods among colleagues by presenting educational in-service programs. • Develop relationships with pharmaceutical representatives and meet with them regularly for product education and updates. — Mary Franz, MS, RD, LDN, is a research dietitian at Harvard University and a freelance medical and science writer. 1. Distinguish medical foods from dietary supplements and nutraceuticals. 2. Evaluate the active ingredients and physiological effects of five medical foods. 3. Identify protocols for third-party reimbursement for medical foods. 4. Instruct clients and other healthcare providers on the potential benefits of medical foods. 1. If insurance reimbursement for a medical food has been denied to your patient, what is the appropriate plan of action? a. Send an appeal letter with signatures from all healthcare team members to the insurance company documenting medical necessity. b. Call the insurance company. c. Contact the manufacturer of the medical food and inquire about the availability of discounted or free medical foods. 2. A medical food developed to treat inflammatory bowel disease might contain which of the following? 3. The FDA regulates medical foods under which law? a. Order the food, document it in the patient’s medical record, and ask the physician to sign the order. b. Present an inservice to the doctor and clinical staff about the medical food. c. Arrange an informational meeting with the medical food’s product representative and the physician to discuss the product’s use and benefits. d. Recommend use of a nutritional supplement instead. a. can be used only when the patient is in strict dietary compliance. b. contains 0.8 g/kg protein equivalent. c. contains serine, cysteine, and aspartic acid. 6. A medical food containing the isoflavone genistein promotes which of the following physiologic effects? 7. Which of the following is true about medical foods? a. They sometimes may be substituted for prescription drugs. b. They always require a prescription. c. They can be used without medical supervision. d. They may contain some of the same components found in dietary supplements. 8. A medical food containing a precursor to nitric oxide would be used for which condition? 9. One of the treatment goals for managing type 2 diabetes with a medical food is to do which of the following? 10. Clinical trials investigating the efficacy of medical foods in Alzheimer’s disease management have found which of the following? MedicalFoods/ucm054048.htm. Revised May 2007. Accessed April 16, 2012. 2. Messner D. Brown bag lecture: ‘food or drug? The advent of medical foods in the U.S.’ Chemical Heritage Foundation website. http://www.chemheritage.org/visit/events/brown-bag-lectures/fall-2010/2010-11-30-messner.aspx. Fall 2010. Accessed April 18, 2012. 3. Wilcken B, Wiley V, Hammond J, Carpenter K. Screening newborns for inborn errors of metabolism by tandem mass spectrometry. N Engl J Med. 2003;348(23):2304-2312. 4. Inborn errors of metabolism. Solace Nutrition website. http://www.solacenutrition.com/products/inborn-errors-of-metabolism/inborn-errors-of-metabolism.html. Accessed April 30, 2012. 5. van Spronsen FJ, de Groot MJ, Hoeksma M, Reijngoud DJ, van Rijn M. Large neutral amino acids in the treatment of PKU: from theory to practice. J Inherit Metab Dis. 2010;33(6):671-676. 6. NeoPhe. Solace Nutrition website. http://www.solacenutrition.com/products/neophe/neophe.html. Accessed April 30, 2012. 7. Matalon R, Michals-Matalon K, Bhatia G, et al. Double blind placebo control trial of large neutral amino acides in treatment of PKU: effect on blood phenylalanine. J Inherit Metab Dis. 2007;30(2):153-158. 8. Acosta PB. Nutrition Management of Patients With Inherited Metabolic Disorders. Sudbury, MA: Jones & Bartlett Publishers; 2010. 9. Minich DM, Lerman RH, Darland G, et al. Hop and acacia phytochemicals decreased lipotoxicity in 3T3-L1 adipocytes, db/db mice, and individuals with metabolic syndrome. J Nutr Metab. 2010;2010:467316. 10. Albert CM, Campos H, Stampfer MJ, et al. Blood levels of long-chain n-3 fatty acids and the risk of sudden death. N Eng J Med. 2002;346(15):1113-1118. 11. Product labeling: Vascazen — pivotal therapeutics. PDR.net website. http://www.pdr.net/drugpages/productlabeling.aspx?mpcode=64258000. Accessed April 18, 2012. 12. FOSTEUM capsules. Fosteum website. http://www.fosteum.com/pi.pdf. Accessed April 18, 2012. 13. Cohen BH, Parikh S. Incidence and prevalence rates of mitochondrial diseases. Mitochondrial News. 2006;11(3):1-16. 14. Item CB, Stöckler-Ipsiroglu S, Stromberger C, et al. Arginine: glycine amidinotransferase deficiency: the third inborn error of creatine metabolism in human. Am J Hum Genet. 2001;69(5):1127-1133. 15. Bhagavan HN, Chopra RK. Plasma coenzyme Q10 response to oral ingestion of coenzyme Q10 formulations. Mitrochondrion. 2007;7 Suppl:S78-S88. 16. Naviaux RK. The spectrum of mitochondrial disease. The Mitochondrial and Metabolic Disease Center website. http://biochemgen.ucsd.edu/mmdc/ep-3-10.pdf. Accessed April 18, 2012. 17. Cyto-Q: general information. Solace Nutrition website. http://www.solacenutrition.com/products/cyto-q/cyto-q-range.html. Accessed April 18, 2012. 18. University of Florida. Phase III trial of coenzyme Q10 in mitochondrial disease. In: ClinicalTrials.gov. Bethesda, MD: National Library of Medicine. http://clinicaltrials.gov/ct2/show/NCT00432744: NCT00432744. Accessed April 22, 2012. 19. Kavalukas SL, Barbul A. Nutrition and wound healing: an update. Plast Reconstr Surg. 2011;127 Suppl 1:38S-43S. 20. Schwedhelm E, Maas R, Freese R, et al. Pharmacokinetic and pharmacodynamic properties of oral L-citrulline and L-arginine: impact on nitric oxide metabolism. Br J Clin Pharmacol. 2008;65(1):51-59. 21. Lee SK, Posthauer ME, Dorner B, Redovian V, Maloney MJ. Pressure ulcer healing with a concentrated, fortified collagen hydrolysate protein supplement; a randomized controlled trial. Adv Skin Wound Care. 2006;19(2):92-96. 22. James DS. The multisystem adverse effects of NSAID therapy. J Am Osteopath Assoc. 1999;99(11 suppl):S1-7. 23. Overholser BR, Foster DR. Opioid pharmacokinetic drug-drug interactions. Am J Manag Care. 2011;17 Suppl 11:S276-S287. 24. Theramine product information. Healthcare Management Associates, Inc website. http://www.nutrientpharmacology.com/PDFs/monographs/theramine-monograph.pdf. Revised December 2008. Accessed April 18, 2012. 25. Mahan LK, Escott-Stump S, eds. Krause’s Food, Nutrition, & Diet Therapy. 10th ed. Philadelphia: Saunders; 2000. 26. Discover the difference — VSL#3. VSL#3 website. http://www.vsl3.com/discover.asp. Accessed April 24, 2012. 27. Rajasekaran SA. Therapeutic potential of curcumin in gastrointestinal diseases. World J Gastrointest Pathophysiol. 2011;2(1):1-14. 28. Rose DJ, DeMeo MT, Keshavarzian A, Hamaker BR. Influence of dietary fiber on inflammatory bowel disease and colon cancer: importance of fermentation pattern. Nutr Rev. 2007;65(2):51-62. 29. Benjamin J, Makharia G, Ahuja V, et al. Glutamine and whey protein improve intestinal permeability and morphology in patients with Crohn’s disease: a randomized controlled trial. Dig Dis Sci. 2012;57(4):1000-1012. 30. LaFerla FM. Amyloid-ß and tau in Alzheimer’s disease. Nature Rev Neurosci. May 2008. 31. Scheltens P, Kamphuis PJ, Verhey FR, et al. Efficacy of a medical food in mild Alzheimer’s disease: a randomized, controlled trial. Alzheimers Dement. 2010;6(1):1-10. 32. Henderson ST, Vogel JL, Barr LJ, Garvin F, Jones JJ, Costantini LC. Study of the ketogenic agent AC-1202 in mild to moderate Alzheimer’s disease: a randomized, double-blind, placebo-controlled, multicenter trial. Nutr Metab (Lond). 2009;6:31. 33. Ginsburg LD, Oubre AY, Daoud YA. L-methylfolate plus SSRI or SNRI from treatment initiation compared to SSRI or SNRI monotherapy in a major depressive episode. Innov Clin Neurosci. 2011;8(1):19-28. 34. Weaver MA, Johnson A. Singh RH, Wilcox WR, Lloyd-Puryear MA, Watson MS. Medical foods: inborn errors of metabolism and the reimbursement dilemma. Genet Med. 2010;12(6):364-369. 35. Buck CJ. 2012 HCPCS Level II Professional Edition. St Louis, MO: Elsevier Saunders; 2011. 36. Reimbursement support. Nutricia Advanced Medical Nutrition website. http://www.nutricia-na.com/pages/insurance_info.htm. Accessed May 4, 2012. 37. WIC-eligible medical foods. US Department of Agriculture Food & Nutrition Service website. http://www.fns.usda.gov/wic/benefitsandservices/foodpkgregs.htm - WIC-ELIGIBLE_MEDICAL_FOODS_. Accessed April 24, 2012.